An international team from CalTech has discovered an incredibly active cluster of galaxies which gives birth to about 800 stars every year. The gargantuan primordial cluster is 9.8 billion light years away from us, houses at least 27 galaxies and has a combined mass equal to 400 trillion Suns. 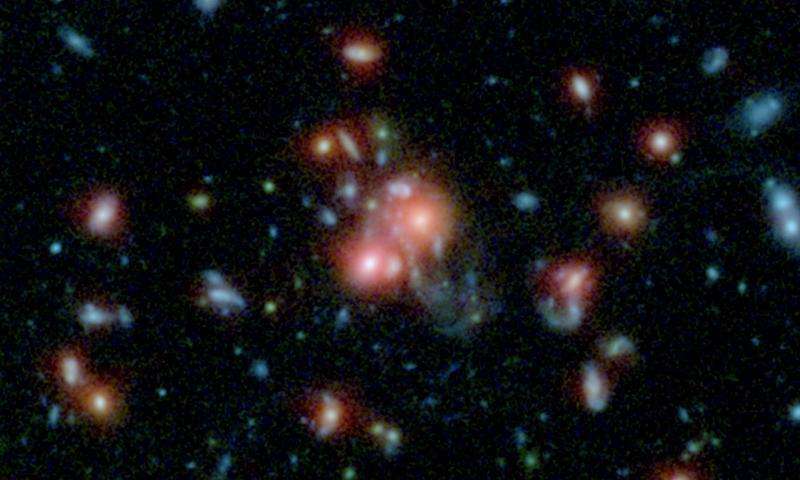 A galaxy cluster is a group of galaxy that usually consists of hundreds of galaxies bound together by gravitational attraction. Our own galaxy, the Milky Way, resides in a cluster known as the Local Group, which itself is a member of the massive Laniakea supercluster. However, our cluster only creates 2-3 stars every year. The discovery, made with the help of the Nasa/ESA Hubble Space Telescope, is quite possibly the biggest stellar nursery known to date. “We think the giant galaxy at the centre of this cluster is furiously making new stars after merging with a smaller galaxy,” said lead author Tracy Webb of McGill University in Canada. The galaxy was initially discovered using NAS’s Spitzer Space Telescope and the Canada-France-Hawaii Telescope, located on Mauna Kea in Hawai’i and confirmed using the W.M. Keck Observatory, also on Mauna Kea. Journal Reference: Tracy Webb et al – An extreme starburst in the core of a rich galaxy cluster at z=1.7. The Astrophysical Journal, Volume 809, Number 2.